Feb. 2, 2016, 9:30 a.m.
By Laura Hazard Owen @laurahazardowen Feb. 2, 2016, 9:30 a.m.
Technology site The Information is inviting some of its subscribers to join it on a trip to China next month. As you know, we’re very excited about China at The Information. And so, we’re thrilled to invite a small number of our subscribers to join me for a special opportunity for exclusive, on-the-ground access to technology leaders in Beijing the week of March 14, 2016. We’re looking for a small number of U.S. entrepreneurs, executives and investors to join us to share their experiences on the ground in Silicon Valley or wherever their home base is…As you know, one of the most important things about business travel is meeting the right people…Space is limited to keep the events intimate. Lessin wouldn’t comment beyond saying that the company is “heads down” preparing for the trip. The idea of the China trip makes sense for a site that is all about premium access. The Information only publishes two stories most days, “deeply-reported articles about the technology industry that you won’t find elsewhere.” For this, readers pay $399 a year or $39 a month (the China trip is only open to annual subscribers). Members also get access to a private Slack channel, commenting privileges, and special events like a subscriber summit. Lessin, a former technology reporter for The Wall Street Journal, launched the site in 2013; it now has thousands of subscribers (“multiples” higher than 2,000, Lessin told Business Insider recently). The site’s business model “totally scales — and it gives us control over how it scales,” Lessin told Digiday in January. POSTED Feb. 2, 2016, 9:30 a.m.
Owen, Laura Hazard. "The Information is offering members a perk: an exclusive trip to “meet the right people” in China." Nieman Journalism Lab. Nieman Foundation for Journalism at Harvard, 2 Feb. 2016. Web. 20 Apr. 2019. Owen, Laura Hazard. "The Information is offering members a perk: an exclusive trip to “meet the right people” in China." Nieman Journalism Lab. Last modified February 2, 2016. 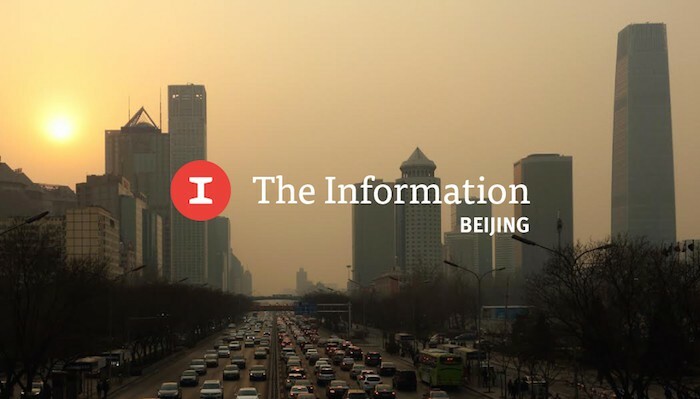 Accessed April 20, 2019. https://www.niemanlab.org/2016/02/the-information-is-offering-members-a-perk-an-exclusive-trip-to-meet-the-right-people-in-china/.